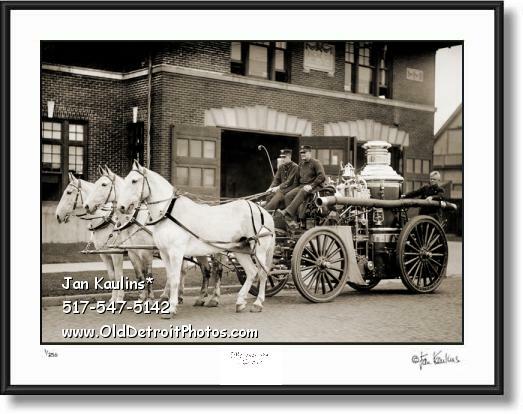 DETROIT FIRE DEPARTMENT HORSES vintage old photo print photograph for sale. This wonderful detailed sepia toned black and white Old Detroit Fire Department Horses photo picture print is made from the restored historic vintage original black and white Old Detroit Fire House Horses photo/negative from around the early 1920's. It shows Detroit Fire Engine Company no. 37 in the background with 3 beautiful white horses lined up ready to pull the old steam pumper. This style of horse drawn pumper has been used since the 1860's by the Detroit Fire Department. The final run for horse drawn fire equipment was in 1922 when they were replaced entirely by the automobile and truck. This is a very historic image from the early days of The Detroit Fire Department sepia toned black and white photo print. "The Detroit department acquired the first motor fire engine in the world, a Packard. A fury of objections by firefighters and Detroiters over their beloved horse's replacement continued for several years. The horse, it was argued, was much more reliable. The motorized vehicles were hard-starting and breakdowns too frequent. By l922, the age of mechanization had arrived. The future of the fire horse was doomed. The tough decision was made to retire the fire department's horses. On April 10, l922, more than 50,000 people turned out to witness the historic last run. The city's last five fire horses, Pete, Jim, Tom, Babe and Rusty, made their final dash down Woodward Avenue as a make-believe alarm sounded at the National Bank Building. Spectators lining the streets cheered as the fire department's band played 'Auld Lang Syne'. Many in the crowd, according to The News, cried as the horses passed. These last five hooved fire fighters were retired to an "Equine Elysium" in River Rouge Park." THESE BLACK AND WHITE DETROIT PHOTO ART PRINTS ARE VERY HIGH QUALITY REPRODUCTIONS OF ORIGINAL OLD VINTAGE HISTORICAL DETROIT PHOTOGRAPHIC PRINTS. THESE SEPIA TONED DETROIT BLACK AND WHITE PHOTO PICTURE PRINTS ARE OFFERED FOR SALE HERE FOR THE VERY FIRST TIME. THEY HAVE BEEN MADE FROM ORIGINAL NEGATIVES OR ORIGINAL FIRST GENERATION PRINTS, MANY OF THEM ARE 50 YEARS OLD AND SOME DATE TO THE EARLY 1920's AND 1930's. THE RARE OLD DETROIT ORIGINAL PHOTOS AND BLACK AND WHITE NEGATIVES USED FOR THESE PRINTS HAVE BEEN OBTAINED FROM HISTORICAL SOCIETIES, NATIONAL ARCHIVES, THE LIBRARY OF CONGRESS AND NUMEROUS PRIVATE COLLECTIONS. IT HAS TAKEN SEVERAL YEARS TO PUT THESE OFFERINGS TOGETHER ON THIS WEBSITE. MANY OF THESE PHOTOS ORIGINALLY CAME FROM OLD DEFUNCT NEWSPAPER AND MAGAZINE ARCHIVES, WHERE THEY WERE USED ONCE FOR A STORY AND THEN USUALLY JUST THIS ONE ORIGINAL PRINT WAS MADE AND KEPT FOR THEIR ARCHIVES. HENCE, THESE HISTORICAL IMAGES WERE NOT ORIGINALLY MADE TO BE FOR SALE, BUT WERE TO BE USED AS IMAGES FOR NEWS STORIES AS THEY UNFOLDED--MAKING THESE IMAGES EXTREMELY RARE HAVING SURVIVED SO MANY YEARS. VERY FEW OF THESE IMAGES HAVE EVER BEEN OFFERED FOR SALE TO THE PUBLIC UNTIL NOW.